If you make pottery from scratch, we will prepare clay by wedging it for you and rolling it in slabs ready for use. After you have made your masterpieces, we will let it dry slowly to avoid cracking. Depending on the items made and the weather this could take up to two weeks. After drying it will be added to the other pots going into the kiln. 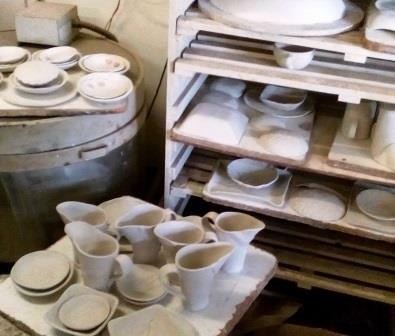 We prepare an entire load at a time, and that can take up to a month to fill up the kiln. The first firing is a bisque firing, which goes up to between 960 and 1060 degrees Celcius. Now we let things cool down, unpack, and sand everything down. We wax the feet to prevent it sticking, we sponge the dust off, we paint what we need to paint, we glaze using the glazes you selected and start packing the kiln again. This we do in the bisque firing, which goes up to between 960 and 1060 degrees Celcius. When the kiln is full, we fire up to 1060 degrees Celcius again, which is called Earthenware temperature.